Tara Burnley and her mural, Brophy Bros. restaurant, Ventura, 2007. Maybe Tara Burnley’s life as a surfer prepared her for a successful fine-arts path in the construction industry. Think about it: Growing up in the subtropical waters of her native Florida, with a big move to sun-soaked Southern California, she learned a lot about color, lines, detail on the horizon, and — what any good surfer grows to appreciate — patience. After moving to the Golden State and working as a lifeguard and junior-lifeguard instructor at Point Magu and Leo Carrillo state parks — while living in her 1965 split-window VW van — she landed at UCSB to major in art, with a minor in art history. Her peers — even some of her professors — said she would never make any money with art. Burnley learned the faux-finishing, antiquing, and distressing of cabinets, doors, furniture, and exposed interior beams. She learned to treat new wrought iron to make it look aged and rusty. She primed and color-matched cracked plaster walls. She also learned stenciling and how to paint murals across big ceilings. Eventually, she branched out on her own, including some high-end signage and mural projects in the hotel and restaurant realms, in Santa Barbara, Ventura, and Los Angeles. She joined Augustine Painting in 2012, coming in on custom-finish jobs and, these days, doing a lot of color consulting for clients approaching the final stages of an extensive remodel or all-new construction. At home painting on her own clock, she said she enjoys oil on canvas, building colors on colors — Maybe like the colorful layering she’s created with her own life. 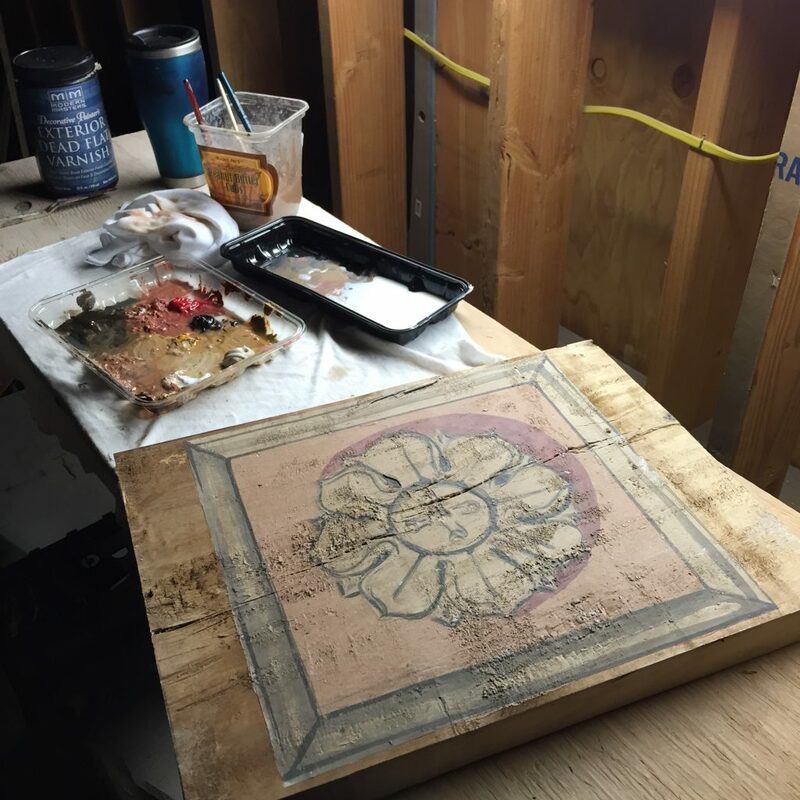 This stenciled wood panel is a restoration Burnley did on an old ceiling from an Italian church.